Continuing with this week’s photo challenge of walls, another great exhibit at the Virginia Museum of Fine Art (VMFA) was that of Japanese woodblock prints. There were two exhibits – prints from Kawase Hasui (1883 to 1957) and a commission from a more contemporary artist, Miwako Nishizawa. Unfortunately, I could not take pictures at the Kawase Hasui exhibit. I watched a film of his process and how the woodblock prints are made, which was interesting. The chisels and knives used to carve out the prints and the precision to get it done was incredible. This process took years to learn and Hasui had two different men who helped him – one that created the woodblock and the other that mixed the dyes and created the print. Hasui’s work is on display on the Internet at the Los Angeles County Museum of Art and also at the Hanga Gallery. 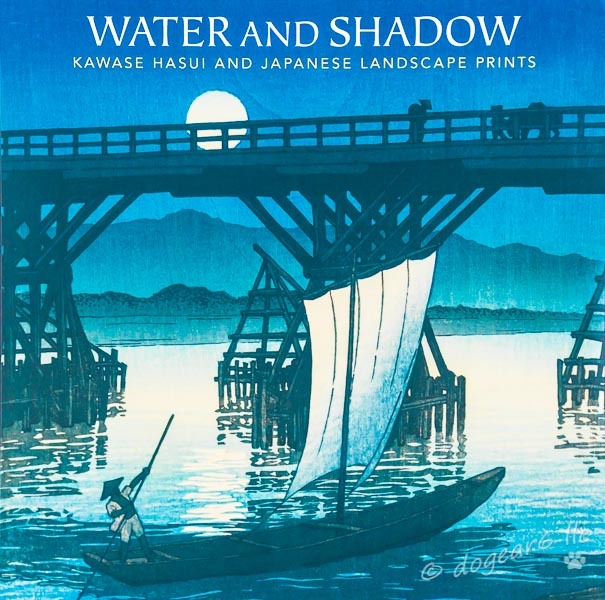 The Hanga Gallery can be accessed by clicking here, then at the top selecting the artist Hasui, Kawase. Unfortunately, I cannot provide a direct link. Note also that these links are good at this time; if they stop working, please let me know. Miwako was commissioned to do an exhibit “Twelve Views of Virginia“. She spent considerable time traveling around the state, taking sketches, and deciding on how to best convey what Virginia is about. I know many of the places she visited – Skyline Drive, Colonial Williamsburg, Natural Bridge, Hollywood Cemetery, Manassas National Battlefield. Others were not familiar to me, but her work made me feel that I would easily recognize them when I visit. The display also had information showing her sketches and preliminary work, as well as other information about the exhibit. I don’t recognize the sketches in any of the woodblock prints, so it is likely they were studies she did but ultimately did not use. One other curious thing that my favorite boy toy and I both noticed was that almost every picture had three stamps on it – two black ones together and a red one on the other side. We’re not sure what they signified but we speculated it could be the stamp of authenticity by the woodblock preparer, the inker, and the artist. The Kawase Hasui exhibit and Twelve Views of Virginia commission were donated courtesy of VMFA members René Balcer and his wife, Carolyn Hsu-Balcer. Carolyn grew up in Richmond and is active in education and the arts. René is known as a television writer, director and producer. His shows include Law & Order and Star Trek: The Next Generation. I very much enjoyed their generosity in viewing these exhibits and am fortunate to have such beautiful things available to me here in my hometown. Part 1 of Walls of Creativity is here. To see what others did with this week’s challenge, click here. Real art! Thank You showing them. You’re welcome. They were incredible and I was glad I could share them. Not everyone lives so close to such a nice museum. Hi I am Miwako Nishizawa. Thank you for taking these beautiful photographs of my work. Regarding stamps, the red one is my seal, two seals on top left are René and Carolyn’s seals. I enjoyed all of my research trips to Virginia. Thank you, all Virginians! I am deeply honored that you took time to visit my blog and leave a comment. Your prints did a great job of conveying what the state is about and I’m glad you enjoyed the time you spent here. Thank you for explaining the stamps! I’m glad you enjoyed the post! Richmond is such a big tourist spot that it would be a shame for me to not share it here. Those pictures actually took a fair amount of editing. I in fact corrected a fair amount of distortion since I mostly had to look up at the pictures, which of course made the bottom smaller than the top! The lighting also wasn’t very good and it all had a color cast. Getting the white balance right was a good trick, even though I used a gray card while I was in there in an attempt to have something to correct to. I’ll keep this in mind for a future blog post since most everyone enjoys seeing how I correct my pictures and getting a good laugh at how badly I can take pictures. A few of them are really tilted to the one side – so frustrating! Although I do have a mild curvature of the spine and I sometimes wonder if that isn’t why I tilt so consistently to one side. Yeah, I have to straighten almost all of them too. Thankfully Lightroom has a tool that makes it much easier. If iPhoto is meeting your needs, I wouldn’t worry about it. My blog posts in 2011 and early 2012 were pretty much straight from the camera and a number of them are pretty good like that too. You’ll do it when you’re ready. In the meantime, you’re doing just fine. I’m way behind reading your posts (I just got back from seeing my daughter a few days ago). I hope to catch up soon. A gray card is something you purchase and due to its coloring, if you hold it under the light and take a picture, you can quickly adjust the whites in the picture to whatever the gray card should have been vs. what it actually photographed as. So with dim light, there is often a yellow cast. By clicking the eyedropper tool onto a gray card, Lightroom or Photoshop will automatically adjust the colors to make the card actually gray instead of yellowish. I can copy over those settings to the other pictures to get color correction. Oh my gosh, Nancy. I’m hopeless. So technical sounding to me. I guess if someone demonstrated and taught me how to do it, I’d get it. Thanks for telling me about it! :-) I need to learn the more technical aspects of photography, but I keep resisting because I’m just not good with technical things. P.S. only one of the links worked for me. And WOW! I’m glad it did. Stunning. Thanks for letting me know! It turned out I couldn’t give a direct link to Hasui, so I changed it to link to the gallery with instructions how to get the prints. I also found that I had his first and last names reversed – I had followed Wikipedia instead of the VMFA. So I got that changed too. Thanks for your wonderful comments! I plan to respond to the rest of them shortly. You’re welcome! I was amazed at the prints. I’m at my lunch break now but I think it was “night rain” or something like that that I really enjoyed. So elegant and real feeling. Again, creativity that just thrills my thoughts and eyes. The ideas and efforts people put in to their visions is astounding. I know – it really is a visual feast for the eyes. And that woodblock process is very exacting and demanding. I don’t think I’d have the patience for it. Me either. Though I ‘wish’ I had that kind of skill and patience. I know I do not. But I am amazed and impressed by it. My husband would be so jealous that you actually have some in the house. Actually, that’s a good idea for me to get him for a present! These were very colorful. I’m not sure if it was her style or the subject matter. The ones from Japan were much more subdued in general – lots of blue and greens and night scenes. I’m glad you enjoyed seeing them. Thanks for leaving a comment! We took a final look at the Hasui prints yesterday and one of the things I noticed is how much they are blue and green. It’s not very colorful, but it’s very peaceful. What a great idea and what wonderful creations! I love this nancy, thanks for sharing! Thanks Tina! I’m glad you liked seeing them. Sheesh! Sorry about leaving two replies on the same post. For some reason, I thought you left a comment on each one of my wall posts. Thanks Tina! I always appreciate when you take a few minutes to look at it and leave a comment. I was really happy with the way it turned out too. Like Charleston, Richmond is quite a tourist town and it does me good to remember that when I’m blogging.